Table Tennis is a sport well known for its role in diplomacy and also in creating life-long friendships between individuals and nations. This powerful story is not only of a talented young girl defying the odds to continue with the sport that she loves, but of the compassion and generosity shown by those who were mightily impressed by her character. I met Shishi Hu a couple of years ago at a training camp at LYTTC, she was an avid young table tennis player with at times a sarcastic whit to her and boundless amounts of energy. She was certainly a talent, among the top 5 under 10 players in the USA at the time. She regularly traveled from New York, participating in camps and training at Lily Yip Table Tennis Center even, across the bridge in New Jersey. She followed table tennis and an opportunity to improve wherever those opportunities presented themselves. In the most unfortunate of circumstances, Shishi and her mother were involved in a car accident last year where they were hit by a drunk driver. Shishi was in a coma for 2 months and suffered damage to her brain which she is still recovering from. Despite suffering from double vision and other ailments from the accident, she has returned to playing table tennis and competing. 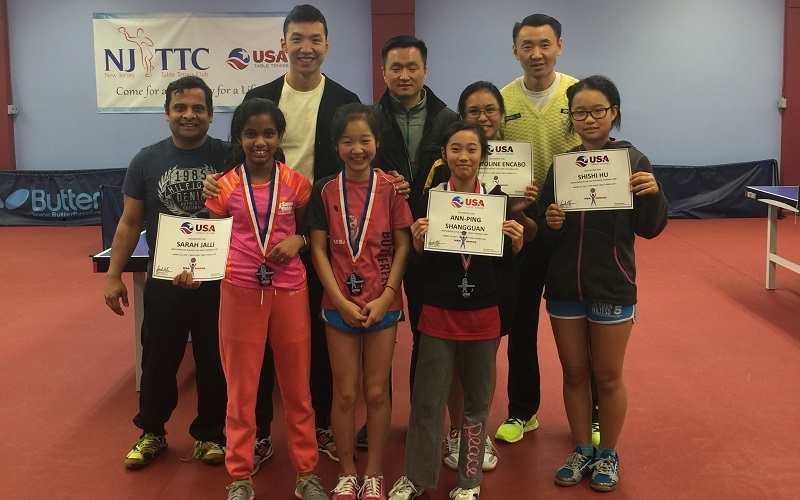 She recently competed in the 2017 USATT New Jersey Regional Hopes Camp and Trial where she displayed some promising results, defeating the eventual silver medalist and narrowly losing out in the 5th to another player. Had she won that match she would have qualified to compete in the 2017 North American Hopes Qualifier at the end of this month. Three players from each regional trial qualified, along with players from Canada, to join the 30 boys and 30 girls who would compete to represent North America at the World Hopes Trial. Her inspirational story paired with her undying competitive spirit and determination caught the eye of many at the event and so through a very compassionate movement from the New Jersey Table Tennis Club and the organizers of the tournament, an appeal was made to USATT to see if Shishi could be given a wild card entry into the North American Hopes Qualifier. With some negotiation and a lot of support, Shishi was able to be included in the tournament which will take place on April 29-30 at the Lily Yip Table Tennis Center. There are no words to express how proud we are to see a young player like Shishi showing such incredible resolve despite all the odds, to continue competing and following her passions. We would like to thank Tony Keisenhofer and the Canadian Table Tennis Association for their cooperation in being able to make this happen. We look forward very much to seeing Shishi in action at the 2017 North American Hopes Qualifier at the end of this month!